ELEX is a hot mess of a game. Anyone who has played a Piranha Bytes game by now (most recently, Risen 3) surely knows what to expect; clumsy combat, an attempt at open-ended gameplay that isn’t quite able to get its quests and conversation trees in order, so has bits of dialogue are all over the place, and difficulty spikes that are obscene thanks, again, to open-ended gameplay without any consideration for how players might actually go about their journey. Related reading: Another B-grade RPG developer is Cyanide, and its last game was also a science fiction title, the Technomancer. Matt's review. And I love it. I really, truly love everything that this development studio pulls together. To me, it’s like those trashy barbarian fantasy or slasher horror films of the ‘80s. They’re the very definition of B-grade, and no one would rightfully say they were well made, but at the same time, for genre fans, they scratch an itch. And in ELEX’s case, that itch is open-ended western RPGs that try to emulate the Dungeons & Dragons, pen-and-paper RPG experience. If you just look at screenshots of the game’s environments, you could be forgiven for thinking that ELEX is a little like Horizon: Zero Dawn from earlier in the year. The world seems to have gone through an apocalypse from a very long time ago, and nature has reclaimed the buildings and artefacts of the past. Many of the people left live in a kind of blended primitive state, where they retain a modern sense of civilization, but have largely left behind the luxuries of the past. ELEX doesn’t take long to show itself to be different to Horizon, though. The most obvious thing first; there aren't giant mechanical robots roaming the landscape. 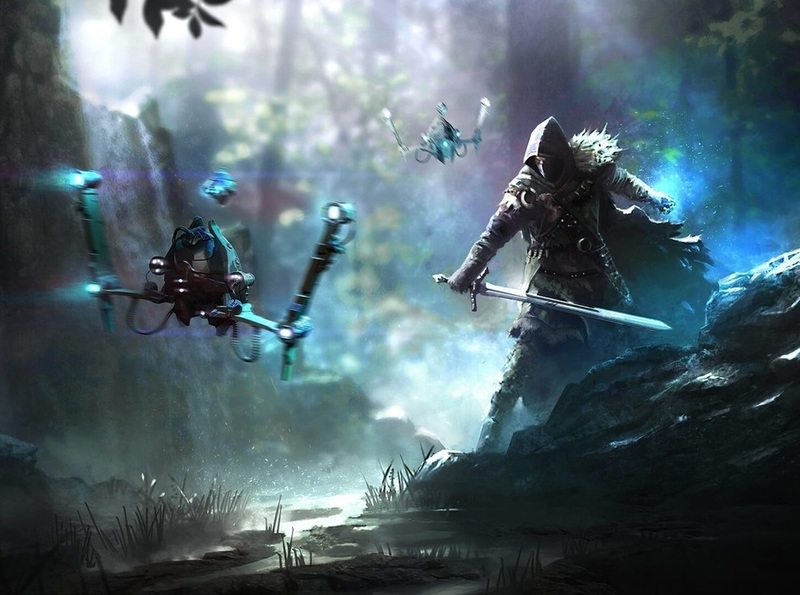 ELEX’s environments are more standard fantasy fare, with fantastic beasts, brigands, and other tropey threats out there for the intrepid explorer. What the game does in a really interesting way, however, is break down its cultures. 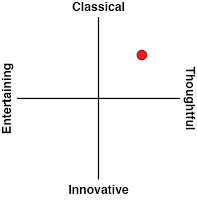 You, as the protagonist, can move across a number of different cultures, each with a very different “tone” – one group eshews technology in favour of old-fashioned magic and swords. 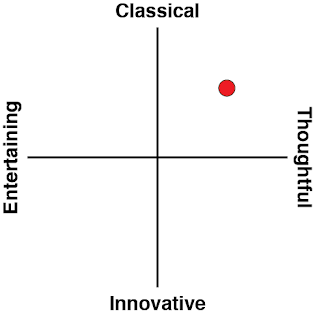 Another group is the polar opposite. A third is pretty clearly inspired by the whole Mad Max thing. The presence of these cultures in the game isn't necessarily the most original examples of world building, but moving between them, forming alliances and getting involved in the politics of the world (the groups are all at each other’s throats) is more interesting than the main narrative. In fact, at one point I had even forgotten there was even a main narrative at all. "Your dude is on a quest for revenge after one of his allies strikes him down in the middle of the wilderness and leaves him for dead," is one of the less interesting quests that this game throws at you. The storytelling within the quests themselves are quite interesting, and varied, even if mechanically they become a case of following icons around the minimap a few too many times. Thankfully though, there aren't too many of them filling up the screen, and ELEX is refreshingly free of superfluous stuff to do that doesn't enhance the game in some meaningful way. Generally weak voice acting and conversation trees do put a dampener on the desire to do absolutely everything within the game, but there are enough quests that are interesting in and of themselves that I found myself happily running around completing the balance of them. One real positive is that many of the quests – even the minor ones – give you plenty of options in how you complete them. 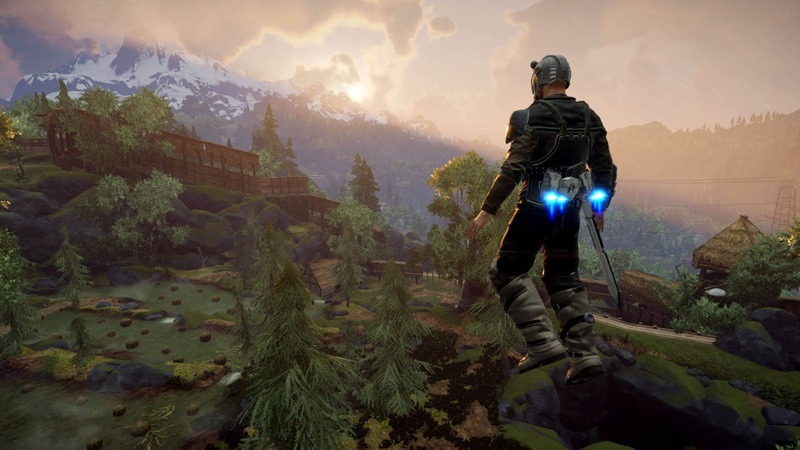 Be it through combat, stealth, or using the handy jetpack that your hero has to cleverly move around the landscape, ELEX is a game that generally rewards creativity. Of course this comes with issues for a low-budget game, a few times I got bugged out of the game completely, but they were rare enough that I was happy to keep looking for wild solutions in solving problems. 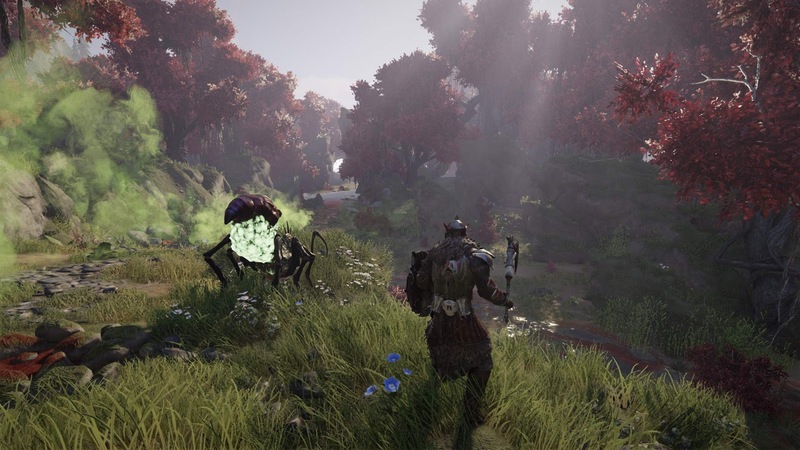 ELEX’s open world is massive, and, until you start unlocking the various teleporter points scattered over the landscape, the game’s penchant for putting incredibly difficult enemies all over the place makes it intimidating to explore around, particularly in the early stages of the game. The more it opens up, the more the fundamental beauty of the world becomes the focus, however, and as that happened I found myself really enjoying exploring around, poking for points of interest off the beaten track… and reminding myself to save regularly just in case I kicked a proverbial hornet’s nest by accident. All I’ve described above have always been the strengths of Piranha Bytes. I spent ungodly numbers of hours playing Risen 2 and 3 precisely because the developer knows how to craft a compelling setting that makes exploration fundamentally interesting. ELEX’s science fiction world is built in a way that makes it a distinctive and original setting, much like you’ve never played anything quite like the Risen games’ take on dark fantasy pirate settings. It’s very easy for these games to simply absorb hour upon hour of raw gameplay time just in letting you get lost in them. But you need to be able to get over the game’s mechanical flaws first, because ELEX plays like an RPG from 10-15 years ago. The fundamentals are there – strong and weak attacks mapped to shoulder buttons, just like in the Souls games, and a roll button in easy reach for mobility around the battlefield. Stamina determines everything that you’ll be doing once combat has been joined, and on a very basic level these systems all work. But at the same time, the reach of enemy attacks can be hard to gauge. I got killed more than once for dancing out of the way of what I assumed was the limit of an enemy’s attack, only to discover it stretched more than I thought. That’s something that never happened to me in any Souls game, Nioh, or most other action RPGs, for that matter. On top of that, the terrain constantly gets in the way; enemies get stuck on landscape which makes them hard to reach (either being too high or too low to hit with your own weapon), and proceed to pull out a bow and pepper you with arrows. The lock system makes combat with more than one enemy more painful than it needs to be, and stealth can be a twitchy system at the best of times. This, coupled with the difficulty spikes and generally poor pacing of the game’s difficulty curve, make ELEX much more frustrating to play than it needed to be. For new players, it’s made all the worse because in those beginning stages the game is brutally frugal. You won’t be able to learn a huge number of even the most basic skills at first because your character’s statistics simply can’t be lifted to the minimum point to unlock those skills until you’ve levelled up a lot. You won’t be able to use any halfway decent equipment, either, because they all also have prohibitively restrictive minimum statistics. Later in the game you will acquire companions that can help out, but the process of getting those companions involves dangerous quests… which you’re not equipped for in the early going. ELEX really wallops you hard in the early stages before becoming more accessible at a point after a lot of people will have given up on it, and that’s disappointing, because I do think that the game could have found a broader audience if it didn't try and intimidate them away from all RPGs first. Related reading: Nick's review of Piranha Byte's previous title, Risen 3. So, you need to be patient and committed to get much out of ELEX, but give it a chance, and there’s a soul in there that should grow on anyone who enjoys their RPGs. The distinctive setting, wonderful world and quest design, and scope of the narrative are all genuinely admirable, and play to Piranha Byte’s strengths as, along with Cyanide, the most prominent and creative B-grade RPG developer out there.